Thirty pounds of muscle mass is enough to completely change your physique, but your ability to add this much muscle mass will depend greatly on your current body composition. If you are thin or do not carry much muscle, then it is extremely likely that you will be able to add this much muscle to your frame. 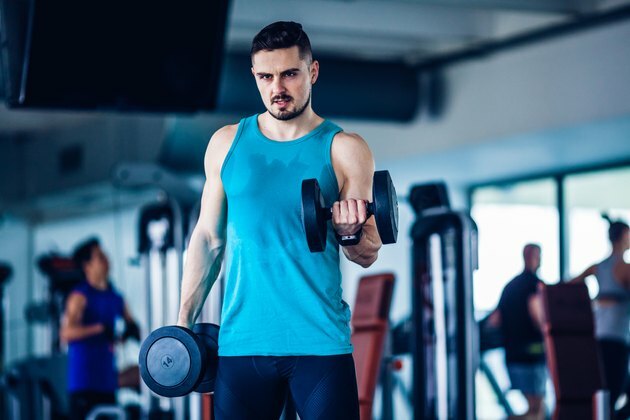 However, if you are currently already carrying a significant amount of muscle on your frame, adding additional weight may not be possible due to natural genetic limitations. Eat enough to grow. According to Build-muscle-and-burn-fat.com, to calculate how many calories you need to take in every day, weigh yourself and then assess your body fat percentage. Subtract your body fat percentage from your weight to figure out what your lean body mass is. For example, if you weigh 210 pounds and have 20 percent body fat, you have 168 pounds of lean mass. Now multiply your lean muscle mass weight of 168 pounds by 19 to come up with a result of 3,192. This is how many calories you will need to eat per day to add muscle while partaking in a muscle-building resistance training routine. Lift heavy weights. To stimulate muscle growth, you will need to overload your muscles with a weight that forces them to adapt by growing strong and large enough to cope with the demands you place on them. The weight you lift should be light enough that you can lift it four times but heavy enough that you cannot lift it more than six times. According to Muscle-building.com, this rep range will sufficiently overload your muscles without fatiguing them, keeping them in an anabolic, or growing, state. Eat up to two grams of protein per pound of body weight every day. Good sources of protein include lean meats, eggs, poultry, fish and dairy products. Your diet can also be supplemented with whey protein powder, a fast-absorbing protein that can be metabolized directly into the muscles, providing them with a quick infusion of nutrition. This type of protein is ideal to consume immediately following a workout when your muscles need protein to begin the recovery and rebuilding process. Take five grams of creatine monohydrate per day. According to The Build Muscle and Gain Weight Fast Guide, creatine is a natural compound used by the body as a reserve of cellular energy, like the type required when lifting or pushing a heavy weight. Your body first uses adenosine triphosphate, or ATP, stored in your muscles for energy. ATP, while it is your body's first source of energy, is quickly depleted, and when this happens, your body turns to the phosphocreatine, or mixture of creatine and phosphates, stored in your muscles to replenish its energy stores. Supplementing your body with creatine help regenerate your ATP stores faster, allowing you to work harder and longer. Creatine also draws water into the muscle cells, giving them a larger and fuller appearance. If you have a pre-existing medical condition that might make gaining 30 pounds dangerous, consult your physician to help devise a safe program to increase your muscle mass. Only perform six to eight sets of weight reps in total, as too much training can cause your muscle growth to stall. Can You Gain Muscle in 2 Weeks?